If you can't see any of your practices on the practice calendar, you likely have a filter active or are on a day without practices. Here are a few things to check. Check the filters on the right (or the lower left when full screen). If you aren't seeing any practices, the easiest thing to do is click Clear Filters. They should then look like the image below. You can also try clicking Today in case you're on a day with no practices. Try logging out and back in again. If you still don't see any, click + Create Practice and add one. A. Active search filter — If you see anything other than SELECT SEARCH FILTER here (tablet) or the icon is blue (phone), tap the box and select Default Filter, then DONE. B. 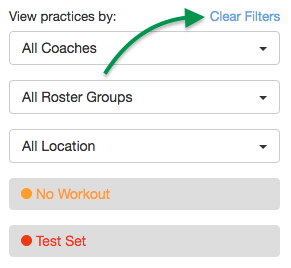 No Workouts — If this button is orange with a white dot, it means you will only see practices with no workouts. Tap to turn off the filter. C. Test Sets — If this button is red with a white dot, it means you will only see practices with test sets. Tap to turn off the filter. D. Date — Are you on a date that has no practices? Try tapping TODAY to turn the letters from gray to blue, use the arrows to cycle among days, or select a different calendar view—WEEK, MONTH or LIST (W, M or L on iPhone). E. View by filter — Make sure your own name or All Coaches is selected.